This appropriation funds a portion of the operations of Michigan’s 15 four-year universities located throughout the state. Currently 232,648 full-time students attend Michigan’s public universities. Three of these institutions — the University of Michigan in Ann Arbor, Michigan State University, and Wayne State University — have large undergraduate, graduate and professional programs. Five institutions — Western Michigan University, Eastern Michigan University, Central Michigan University, Oakland University, and Northern Michigan University — offer primarily undergraduate programs, but also offer some graduate programs. Programs in specialized areas are emphasized at two institutions: Michigan Technological University, which offers primarily engineering courses, and Ferris State University, which offers primarily vocational and technical programs. Three institutions, as well as the University of Michigan’s two sub-universities in Flint and Dearborn, offer primarily undergraduate liberal arts programs; they are: Grand Valley State University, Saginaw Valley State University, and Lake Superior State University. In December of 2002, then Governor Engler reduced the appropriations for higher education by $40,388,994 through Executive Order 2002-22. 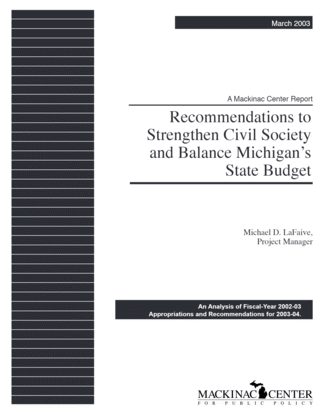 The Center updated appropriations figure is used here to calculate savings. Although the direction of higher education funding should be toward using tuition vouchers or tax credits to replace direct state grants to public universities, such changes may be politically difficult at the moment. Such a move would provide universities with stronger incentives to control growing costs, a problem the Legislature should take more immediate steps to address. Spending at Michigan’s 15 public universities has increased to levels that few could have anticipated and some believe are unjustified. Total spending by universities from fiscal year 1985 through fiscal year 2002 increased by more than $5 billion in nominal terms. Both state appropriations to public universities and the revenue they derive from tuition and fees have helped fund the extraordinary increases in higher education spending. Total state appropriations for university operations increased from approximately $760 million to $1.615 billion since 1985. The increase is 24 percent more than inflation, but full-time enrollment increased 28 percent over this time. During the same period, however, students’ tuition and fees skyrocketed. In fiscal year 1985 the tuition and fees charged to all full-time public university students (not weighted by population, program of study, or school) averaged approximately $1,786. If tuition and fees had increased at merely the rate of inflation, students today would pay only $3,093 annually instead of the fiscal year 2002 average of approximately $5,365. This means today’s students, on average, pay about 73 percent more than they would have to pay if tuition and fee increases had just kept pace with inflation. Since higher education spending is one of the largest drains on the state budget, it deserves special scrutiny at a time of historic projected deficits. Increases in tuition and fees in excess of inflation suggest one way to determine a reduced state appropriation. Universities are charging students $547 million more per year than can be explained by inflation alone. With more than a half-billion dollars in new annual revenue from students, the universities should be less dependent on the state. A $547 million cut is justifiable and technically possible, but a starting-point reduction, for the coming year, of 20 percent of that amount would still yield significant savings of $109.4 million. Recommendation: $109.4 million. This line item was transferred to this portion of the report from the Michigan Department of Career Development (MDCD) chapter. This appropriation funds administrative expenses for five programs. They are 1) Community Colleges Services; 2) King — Chavez Chavez — Parks Initiative; 3) Proprietary Schools; 4) Veterans Education; and 5) Educational Corporations. Elimination of the King-Chavez-Parks programs (see below) allows eliminating 20 percent of this line item. This is an estimate only, and a detailed analysis of the impact of programs reductions is needed to determine precise savings. The remaining funds transferred from the MDCD will be added to the appropriation summary above. Transferred from MDCD: $1,992,240.